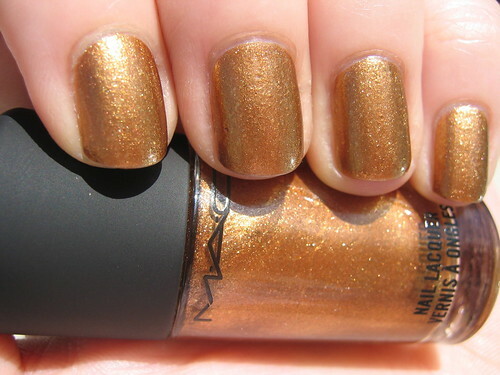 The first mani you're seeing is four coats of NYX Paradise and one coat of Chanel Illusion D'Or. I did this mani twice in a row because when I was nearly finished the first time, the NYX bottle knocked over and spilled all over the floor (and my p.j. pant leg)! You ever try cleaning up a spill with freshly painted, still wet nails? Yeah, doesn't work. Anyway, this was pretty and I enjoyed it. 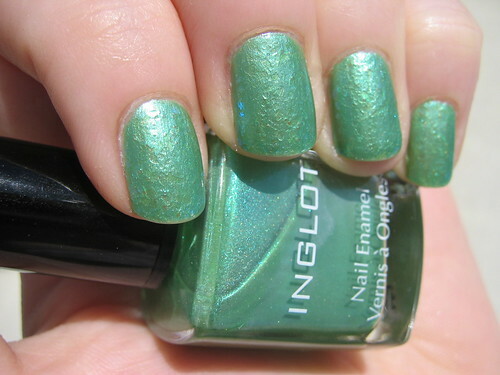 Here I did Inglot 320, two coats, topped with a coat of Inglot 203. The flakes on top of the frost gave it quite a bit of texture, but I still think it's kind of cool! It reminds me of a crazy Christmas Tree ornament my mom has. It's a metallic, frosty pickle. Yeah, a pickle. Something to do with a German tradition or...something. 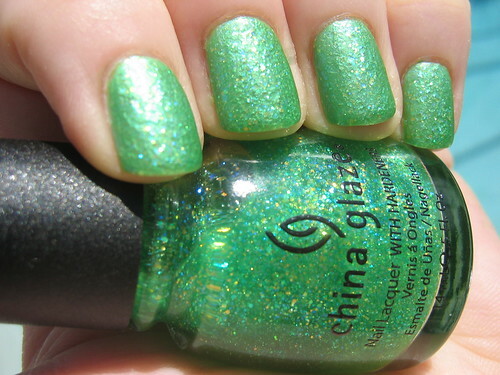 Then I threw on a coat of China Glaze Sour Apple and a coat of Matte Magic! Still looking like crazy pickles, but fun no less. What do you think? Totally bonkers? 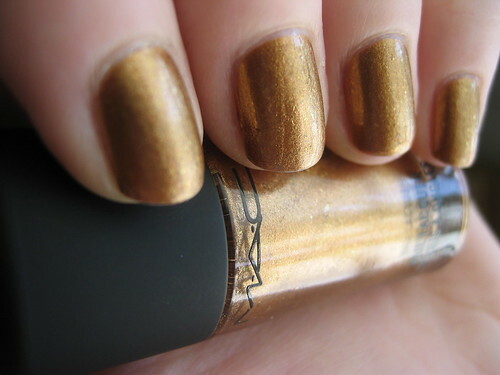 This is my current mani, MAC Originality, two coats. 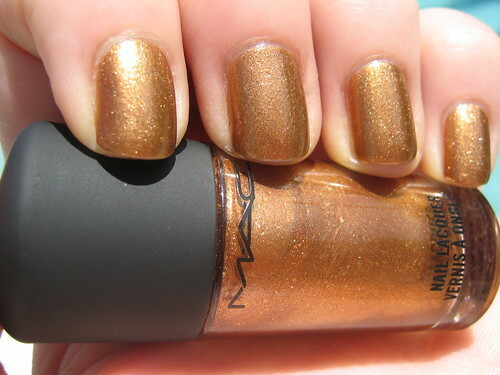 It's a coppery frost with copper flakes. 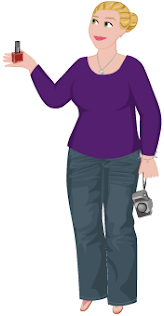 It is a dead-one match for Urban Decay's Baked color! I have the eye shadow and the eyeliner. I think of them as my Baked nails. 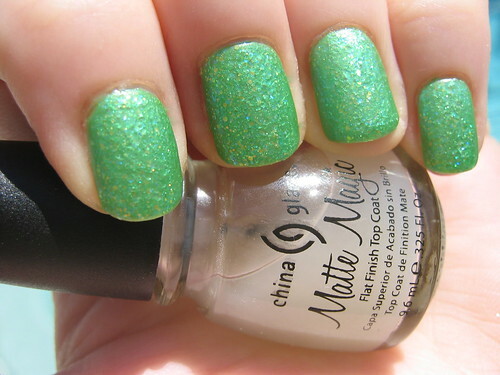 I love this color, but am not in love with it on my skin tone. I think it's do-able, though. 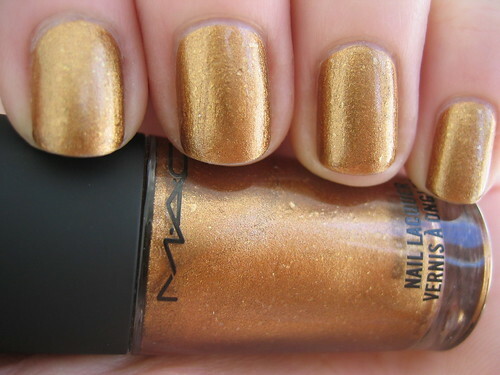 Also reminds me of shiny pennies...with texture.